Don’t you think that life would be a whole lot easier if you could get access to your iPhone’s files and folders quickly and easily? If you answered yes, you’re going to absolutely love iExplorer (formerly iPhone Explorer) because it allows you to do just that! This program essentially turns your phone into a USB stick – All you need to do is plug your phone into your computer or laptop and you’ll receive instant access to all of your files and folders immediately! From there, you can choose to drag and drop items that you’d like to keep on your desktop, or simply work on files from your desktop and put come back to them on your phone later when you’re out and about! - A drag and drop interface that allows you to quickly and easily copy files to and from your iPhone. - Lets you create, delete, and rename files and folders on your iPhone and iPod Touch super quickly and with no effort at all. - Works with all iPhone and iPod touch models, including the iPhone 3G and iPod Touch 2G. - Gives you the opportunity to use your phone as a USB flash drive or put your phone into disk mode. 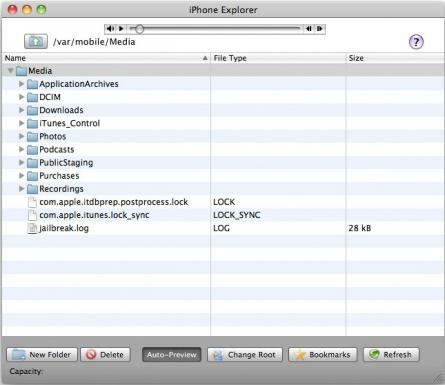 - Jailbroken phones can gain access to the real root of the iPhone and recover your address book, SMS, and more.